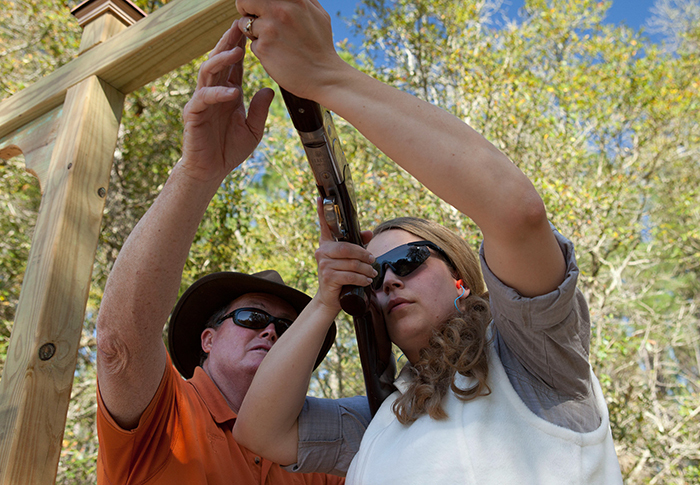 "Warm up on our raised deck 5-Stand or take up the challenge of our 14-station sporting clays course. Test your marksmanship at our rifle/pistol range or tune up on our 3-D archery targets"
The Gilchrist Wingshooting School offers expert instruction provided by our staff of NSCA and Orvis certified instructors. Leading the Gilchrist staff is our general manager, Bob Edwards who served as shotgun sports manager for the NRA, Senior Instructor for the Remington Shooting Schools and chief instructor for Sporting Clays Magazine. The Gilchrist Wingshooting School provides a curriculum structured on the instinctive approach to shotgunning. Using the natural abilities of both the novice and the seasoned veteran, our program is a complete shooting system that can be used for upland and waterfowl hunting as well as sporting clays. The instructors are consummate professionals who are beside you for every shot quietly analyzing and improving your shooting abilities. Post your own photos while visiting us! Just tag us using @gilchristclub.